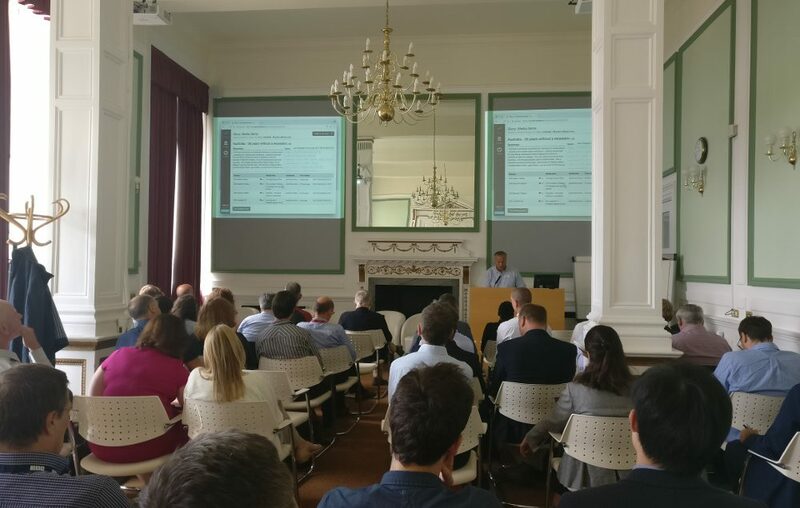 The SUMMA user day, held on 3rd July 2017 at BBC Monitoring in Caversham, turned out to be a big success. Representatives from over 30 external media organizations, media access companies, government and research laboratories, and the like took part in the user day. After an introduction by coordinator Steve Renals from the University of Edinburgh, Sara Beck, head of BBC Monitoring, and Chris Hernon talked about Motivation and Vision for automated technologies at BBC Media Monitoring. Peggy van der Kreeft from Deutsche Welle explained how the SUMMA Platform can benefit a world broadcaster in monitoring media production inhouse. Guntiz Barzdins, from LETA, the Latvian Information Agency, and SUMMA platform integrator, demonstrated the latest release of the live platform. The more technical part started with enlightening talks by Steve Renals, on speech recognition, and by Ulrich Germann, on Machine Translation, both from the University of Edinburgh, and on Fact Checking issues and efforts by the Jeff Mitchell from University College London. This was followed by a well-attended poster session with technical posters on all SUMMA components: speech recognition, punctuation, machine translation, storyline clustering and topic detection, entity tagging and linking, knowledge base construction, fact checking, story-level semantic parsing, story highlight generation, data gathering, and the SUMMA platform. A captivating and revealing panel discussion, moderated by Alexandra Birch from the University of Edinburgh, and with four panel members, i.e., Els Kindt (Data Protection Law Specialist, University of Leuven), David Padmore (head of Access Services, TVT), Steve Plunkett (CTO Ericsson Media Tech), and Artur Romão (Director, Innovation and Development, DECSIS), covered a broad range of topics from the current impact of natural language tools on the field of media and monitoring, to the ethical dilemmas posed by such tools. There was general agreement that these tools will be an ever more important part of industry and that businesses who do not adapt will no longer be competitive. People’s jobs are not under threat from automation, even if their roles might change to focussing more on analysis and insight than on lower-level tasks like transcription and translation. In developing automated tools, Els Kindt reminded us all to be aware of data protection and ethical issues, making sure that we follow EU law. Finally, there was an interesting discussion about the threat to the media industry of companies such as Facebook and Twitter and that traditional media players need to adapt their coverage to personalised and mobile data streams, while still providing people with trusted and reliable news. In brief, a user day that proved successful in many ways – it was informative on the media monitoring side as well as the technological side, it brought together a broad, yet connected media-focused group, strengthening networks, and raised interest from different perspectives. More such user days will definitely follow in the second part of the SUMMA project. Stay tuned.